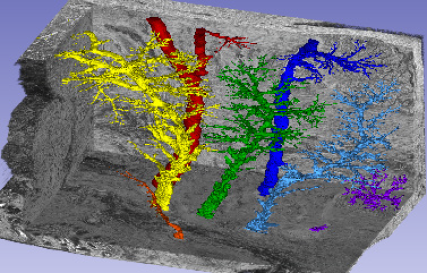 HistoDigital (HiD) is an application that enables you to create a digital 3-D reconstruction of the anatomical tissue structures from the datasets of your histological slide images. In the spatial reconstruction of your data with HiD, we attach particular importance to the anatomically accurate reconstruction of the original tissues through the iterative application of special algorithms in order to enable a powerful analysis an interpretation of the structures. 3D reconstruction enables powerful analysis and interpretation of the structures. The user interface gives you quick and clear access to all functionalities of the program. In this example a 3-D reconstruction has been done on histological slides from a fetal kidney dataset.The right images show transversal and sagittal view of the 3-D volumetric reconstructed kidney. For further information or if you like to request a demo please contact us here. Innovative software development for medical image processing. We provide services using artificial intelligence, our Chimaera SDK - an image processing framework and OEM libraries for segmentation and registration.